The title says it all. This thread is for discussion and development of the first level of the "final" RTJP, RTJP~Helipad. I will upload appropriate screenshots and other information here so that the other topics from the older version can be less crowded. The other levels will receive a similar treatment from this point on. With that out of the way, I'll say that RTJP's heightmap is completely finished and imported, and I have begun development of RTJP~Helipad. So far I have completed the helipad and its accompanying canyon and am beginning to build up the area in the southern mountains that will be explored immediately at the start of the game, which includes a new location that I don't think I have mentioned before and will keep secret until later. The great thing about all of the levels using a single large heightmap is that you can continuously modify it and these changes will remain consistent through all levels. The helipad itself looks almost exactly as I had intended it to, with a bit more accuracy than the past incarnations - I might do a comparison screenshot one day once it's 100% finalized. The fact that I'm no longer as worried about object limits has allowed me to add higher levels of detail to the level as well, so that now every easily noticeable plant in the actual movie plant is able to be included rather than just a very small number of the largest ones. In addition, I have selected a completely new set of plants to use in the level, which I believe are the most accurate possible selections for the Isla Nublar environment. Some of these are still from JPDS, but I have added a number of them from both the vanilla game and my MegaJungle level to keep things feeling fresh. There are also some brand new plants in addition to these, most notably some super low-poly distant bushes to cover the hills of the island - something I have never been able to get right until now. I have also made a number of new ground textures as I felt that some of the older ones were too dark and were not befitting of the brighter colors that are present in RTJP - not too different as I kept the same palette, but still a bit more colorful. At the moment I am currently busy moving again, but come this Sunday or Monday I should be back in business full-swing and I hope to have a screenshot of the helipad area at some point soon (yes, I know I said I wouldn't show many screenshots, but you guys all know what the waterfall looks like anyway so no surprises here). Last edited by TheIdiot on Fri Oct 06, 2017 7:54 am, edited 1 time in total. I cant wait for those screenshots in the next couple of weeks! I've already made a decent amount of progress, yes. And the good news here is that most of the models that I need for this level are already done...just need to make one large building and a few little ones. I used a lot of reference from real-world locations, the island seen in Jurassic Park and Jurassic World, as well as a number of maps seen in the film in order to create what I believe to be my most accurate version of the island. There are areas that will likely be changed here and there, but this is pretty much the final product. Hopefully I can get the heightmap fixed soon (trying to get it done today myself, if not I could use some assistance from the experts) so that I can make that helipad comparison series, as well as continue progress on RTJP~Helipad. Nice map! Sam did lots of research on it back in the day... Might consult him. Yeah, I used a lot of reference material - much of which I got from hppav's old JPO mod (the position of the Northern Mountain Range is based on his JPO map). The layout of the roads and fences is also based on his Nublar map he made a while ago, and the height data was based on the Nublar map seen as the tour begins in the movie, but ultimately I had to do a lot of modification to it in order to make it work. Overall, I think this is just about right - I can even start picking out specific mountain ranges from various shots in the movie. The only area I don't like is the cliff that sort of arises out of nowhere next to the Jungle River, which I had to make in order to have enough height for the Aviary. I'll have to blend this area in more with the landscape eventually. So after all that time faffing about, I've managed to fix the problems with the terrain and resume development of RTJP~Helipad! In that time, I worked on a few minor prop models here and there, as well as done a fair bit of work on one of the never-before-seen locations that will be present in this level. 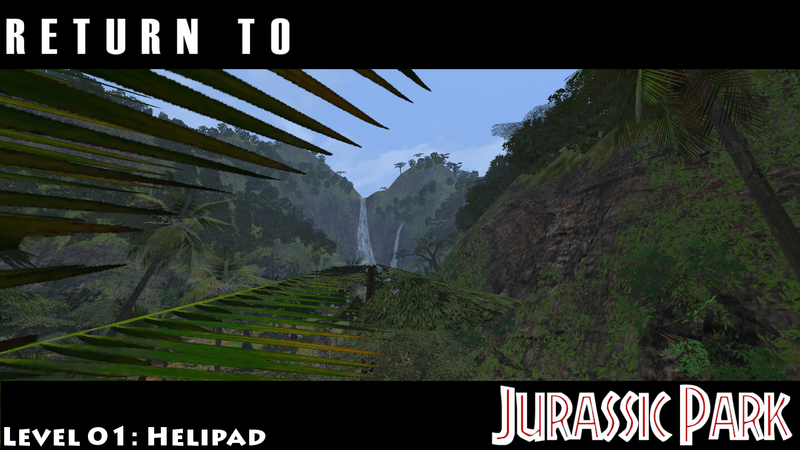 Considering this level covers a fair amount of Isla Nublar (though is quite linear), there are a good amount of new locations to explore, which means a plethora of new models - most of which will, fortunately, be relatively easy to make - need to be created. This level will also contain all of the areas shown in the demo video I uploaded a while ago, except these will be remade with more detail and with greater geographical accuracy. At the moment, I'm finishing off the waterfall area. I doubt I'll get it done by tonight, but come the weekend I should FINALLY have that comparison shot I mentioned previously since the helipad falls are about 90% finished at the moment, with just 2 or 3 props missing and a minor bug with a tree texture being the only things holding it up. Sweet. Btw.. let me know what RTJP things I can help with. Sent you a PM. There's still a fair bit of modelling to do! At long last, the awaited comparison gif! Wow. Taking these screenshots has really given me a bit of a trip back-in-time! 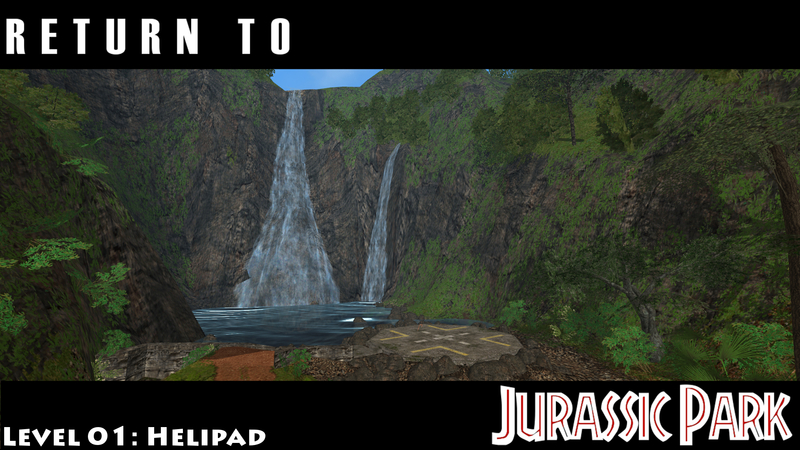 Here you can see the progressive evolution of the helipad, waterfall, and surrounding canyon since the very first inception of RTJP. The first image from 2009-2011 was made without any prior planning or research - I just made it based on my memory. Back then, I didn't know how to make new models and had little understanding of Trespasser. As such, everything used existing models re-tooled for other purposes - for example, the helipad itself is a stop sign re-textured and with the pole hidden. You can download this level at TresCom if you want to see what I was like when I first started modding. Next up we have the 2012-2013 incarnation of RTJP, and the first one I began showing off publicly. There are many major errors in detail here due to my heavy use of the seemingly inaccurate JP Legacy Nublar map and very little film reference. This level is just as outdated as the 2011 edition and is nowhere near up to my standards today. Unfortunately I had to take the screenshot of this level in TresEd as the level seems to be broken in some way or another. Then we come to the 2014-16 RTJP - the one I've been showing off up until now. While I did quite like this level, I slowly came to realize that recreating Nublar in a single Trespasser level was impossible at this scale - the engine simply can't handle it. Additionally, I had to use less detail than I would have liked in order to keep the object count low. Even so, I knew I still could do better. You guys know the story - either way, the level had to be scrapped, which, in the end I believe to be for the better. So, finally, we come to the never-before-seen waterfall in the final, current version of RTJP (which will appear in the first stage, RTJP~Helipad). As film accurate as I could make it, with a long time spent examining shots of the movie and even overlaying the real terrain, this will be the most accurate Nublar waterfall possible with what I have learned over the years. While there are still a few props missing, this is definitely the representation of the helipad that will appear in the final release! Amazing! Really, really like the way it looks at present. Looking at how good those textures for the mountain side look, it really doesn't feel like Trespasser. How did you do that so they don't get stretched too much? :| Amazing! Really, really like the way it looks at present. Almost ended up using the ReShade too, which would have made it look even more fancy. Regarding the stretching - I think it might be a combination of my CE settings along with just the amount of time I spent getting the textures to look the way I wanted. Took me about an hour for just the cliffs, if I remember correctly. Also the cliffs themselves aren't too steep as I find that the steeper you make them, the worse the textures become. If you find the textures stretching too much, you can scale down the TrnObjs as well as that seems to help a bit. Been just over 24 hours, so screw it, I'm double-posting. Took this shot a short ways from the Helipad in the completed canyon area. I've been fiddling with the lighting for much of today and finally got it looking as close to the movie as I think I can get it. It's somewhere between the previous version of RTJP and the somewhat more colorful lighting from vanilla Trespasser's Beach level. The fog settings still might need a bit more editing as I want a more misty look to the level, but overall this is what I'm sticking with for now. I also might set the low-poly mountain shrubs to "bool Unlit = true" so they don't receive shadows and therefore blend better with the terrain. Also have no idea why palm trees that are further away have that odd whitish tint to them - might have something to do with the mipmapping of the .dds files.